This week, I had a wonderful opportunity to host a visit and travel with Ben Taphouse, the Sales Director of Lewis and Irene, a young and enterprising fabric company based in England. Choo Choo Quilters guild meeting. The "Lindos" collection was a guild favorite. Lewis and Irene is a family-owned fabric company serving the sewing, quilting and crafting businesses across Europe and is now introducing their "sophisticated cute" fabric collections and fashion blenders to quilt shops in the United States. I am one of the direct fabric reps in the US. fossil found at the site. Ben's visit coincided with my quilt guild's monthly meeting, so the Choo Choo Quilters gave Ben a warm, enthusiastic welcome to Chattanooga on his first evening in town. 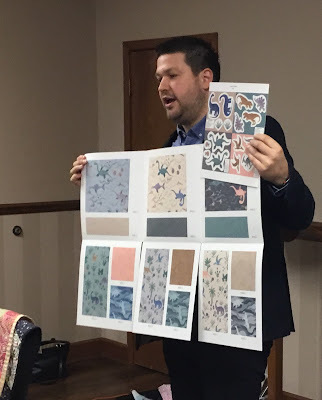 Guild members got an up-close-and-personal preview of all the new Lewis and Irene fabric collection as Ben presented them along with the inspiration and personal story behind each collection. Strike-offs (printed fabric swatches of the designs) were available for attendees to feel and inspect. Lewis and Irene's fabrics are made from grade A1 cotton and the company vetted several mills before choosing the one to print its fabrics. The Lewis and Irene team keeps attentive watch on design execution and print quality and is pushing boundaries with metallic, opaque pearlescent and specialty fabric inks. Be on the lookout in September 2018 for the "Fairy Lights" collection that incorporates glow-in-the-dark inks as a focal point of the designs in the collection. Note that "Fairy Lights" was voted a "guild favorite" during the presentation. Quilters: Be watching for these fabrics to arrive in Chattanooga area quilt shops and other quilt shops across the country. 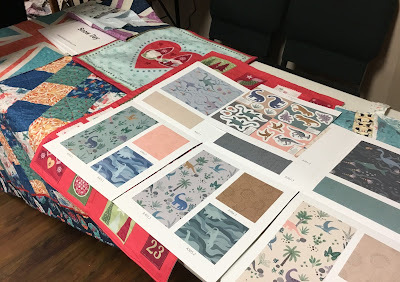 At the guild meeting, there was an array of samples--quilts, pillows, tote bags--made from the free patterns available from the company's website. 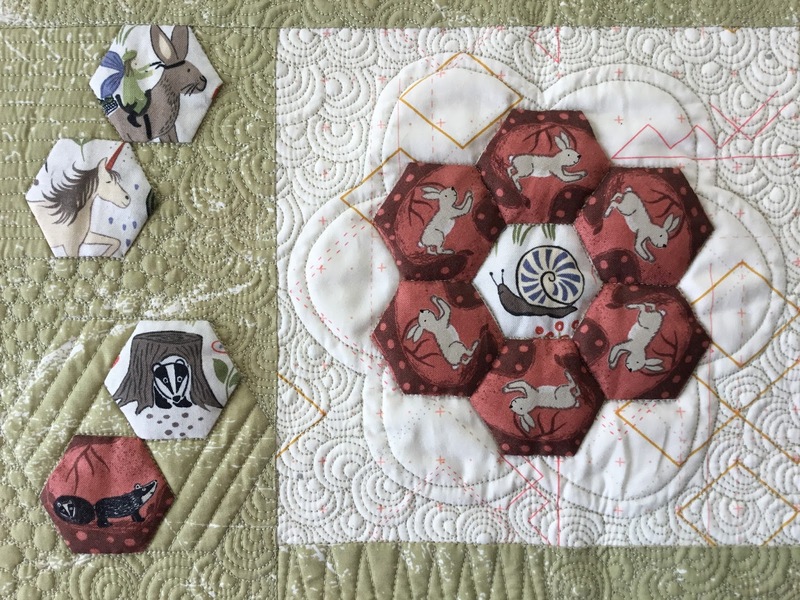 Quilts and samples of projects made with Lewis and Irene fabrics. 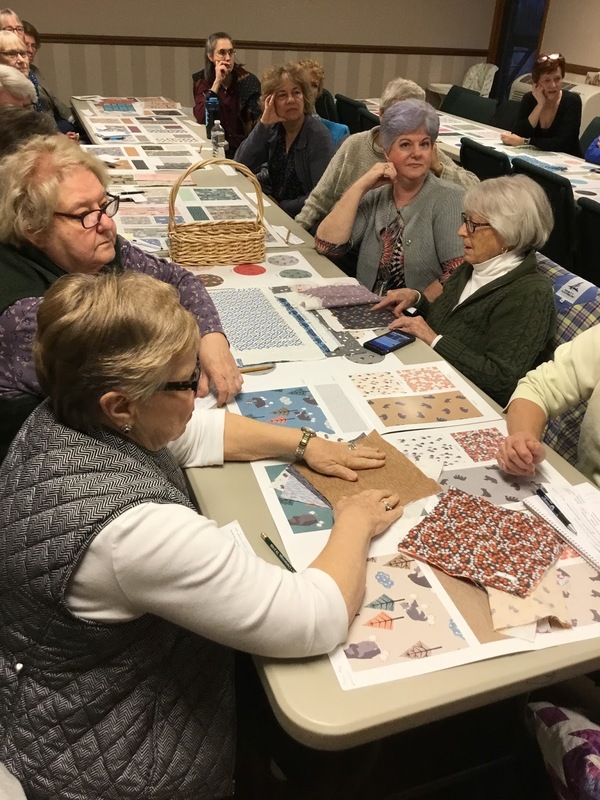 Ben encouraged the guild members to post their own projects made with Lewis and Irene fabrics to the Lewis and Irene Facebook page. The company loves sharing the accomplishments and creativity of quilters, sewists and crafters! Detail of a quilt featuring hexagons cut from "Enchanted Forest." 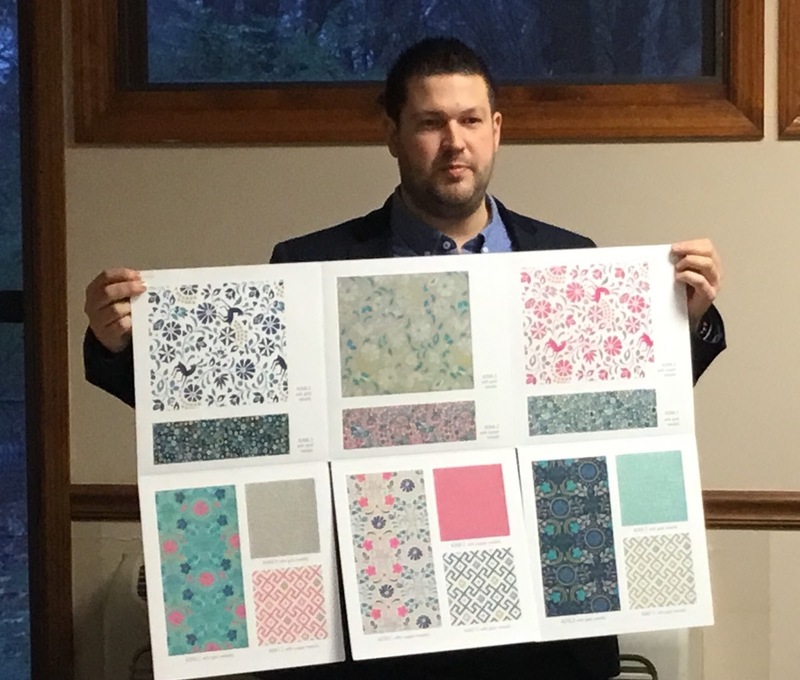 During the presentation, Ben relayed the story surrounding the forming and naming of the company--which was named after his grandparents--and endeared attendees even more to the fabrics, the company and the company's core values. The brand's tagline is "threaded with love." 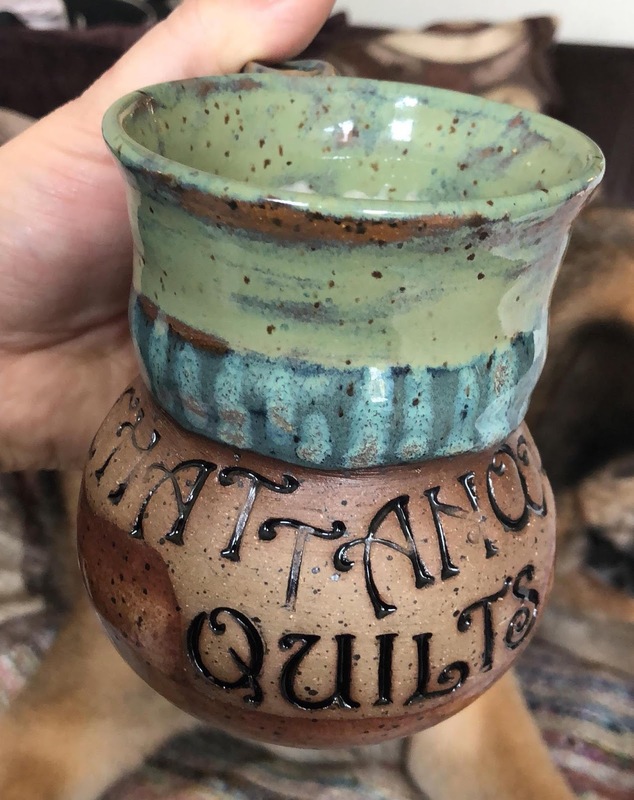 Hand-crafted ceramic mug by local artist. Ben's Thank You gift from the Choo Choo Quilters was a Chattanooga Quilts ceramic mug. I've heard on good authority that Ben and the mug made it safely back to England and Ben has already put the mug to good use. Thanks for visiting the USA and spending time with the Choo Choo Quilters, Ben! Several quilt shop owners, shop associates, and area quilters from Tennessee and Georgia also had the pleasure of meeting my guest from England and hearing the Lewis and Irene story. Stay tuned for part 2 of my travels with Ben. Lewis & Irene VIP is visiting Chattanooga!